I kept moving with the crowd but the snow beneath my feet was turning to ice with every step due to the heat radiating from the raging fire and the pulse of a thousand bodies. The fire festival arena in the small mountain town of Nozawa Onsen, nestled high in the Japan Alps was packed with revelers. 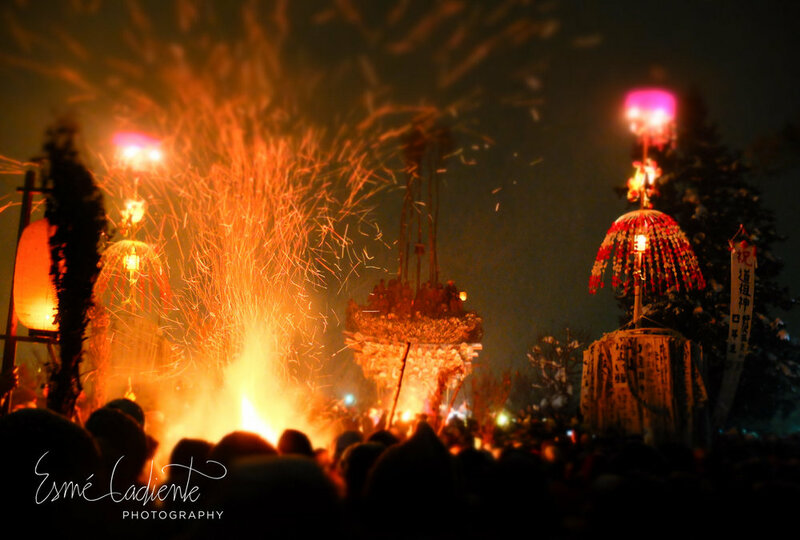 It was January 15th and the annual Dosojin fire festival was in full swing. All of the 42-year-old men in the village were perched on top of a wooden pyre while all the 25-year-old men were clinging to ropes at the base of the pyre and imbibing huge amounts of sake. Other villagers were either stoking the giant bonfire in the middle of the arena, rushing the pyre with flaming wooden sticks, or beating on huge drums and chanting. On lookers included the remaining villagers and a handful of risk-appalled tourists. From what I gathered, and I know there is more to this ancient historical tradition, 42 and 25 are yakudoshi, unlucky ages in Japan, which means that every year the new batch of 42 and 25 year-olds hold an all-out-sake-infused battle with the other villagers where they try to light each other on fire (not really, but it does appear that way). The 42-year-olds nest high into the pyre while the 25-year-olds guard the pyre from the villagers who rush the pyre with torches and try to light it aflame. All of this happens after several hours of chanting and singing laments about sake. Children run through the crowds brandishing flaming bamboo stalks, swinging them around wildly to oxygenate the torch and keep it lit (or to scare the hell out of tourists, but who’s to say what their intentions are). Meanwhile, at the back of the arena, men are stoking a giant bonfire, and so slowly it is hardly noticeable, pushing the enormous bonfire down the incline toward the pyre. They do this by feeding the front of the fire and pushing /rolling the back of the fire with long bamboo stalks after it consumes the fuels. Eventually, the fire is dangerously close to the flammable wooden pyre, at which point the 42-years-olds disembark from their deathly wooden observatory and the 25-year-olds untie themselves from the base of the structure. The wooden pyre is then set to flame, along with other tall lantern poles and anything else that is not human and flammable. The festival dates back to 1863, and pretty much resembles the same medieval war-like battle as it did then—with a few more drunken Australian on-lookers. The flames are an offering to the Gods for the health and prosperity of first-born sons in the village. The next day we could see the charred scar the festival left on the snow packed arena from the chairlift. We woke up early having drank far less sake than most people in the town the night before and caught an early gondola up the mountain. It had snowed almost a meter overnight and the fat flakes were still falling. The following day unfolded as one of the best I have ever had. We snowboarded until our back legs felt like jelly, stopped for the most amazing ramen I have ever had and then squeezed out a few more runs before we could hardly stand up anymore. Every single run was fresh tracks, the kind where you have to wake up at 4 am in the U.S. to drive to the ski area to wait in line for three hours before the chair opens with a handful of other jostling-anxiety-caffeine-fueled-diehards to get. Our last run was our best run – free refills of the best, deepest snow I have ever seen. It proceeded to snow ten feet in seven days—turning a dream I thought was only a fiction of my powder-hungry imagination into a reality. I can’t even begin to tell you how amazing this powder-filled week in Nozawa Onsen and Myoko Kogen was. So I won’t. I do believe the photos below will speak a thousand words. Nozawa Onsen is famous for its multitude of free, public bath houses fed by a melt-your-skin-off-your-body-hot hotspring water system that feeds 13 bath houses around town and runs below the streets. The hot spring water gushes through canals all over town and the villagers use it to melt the snow in the streets. This method is so effective that I never once saw a snowplow. Tiny footpaths, bridges and skinny alleys intertwine with the snaking canals that melt snow in their wake and give the town a magically, misty appeal. 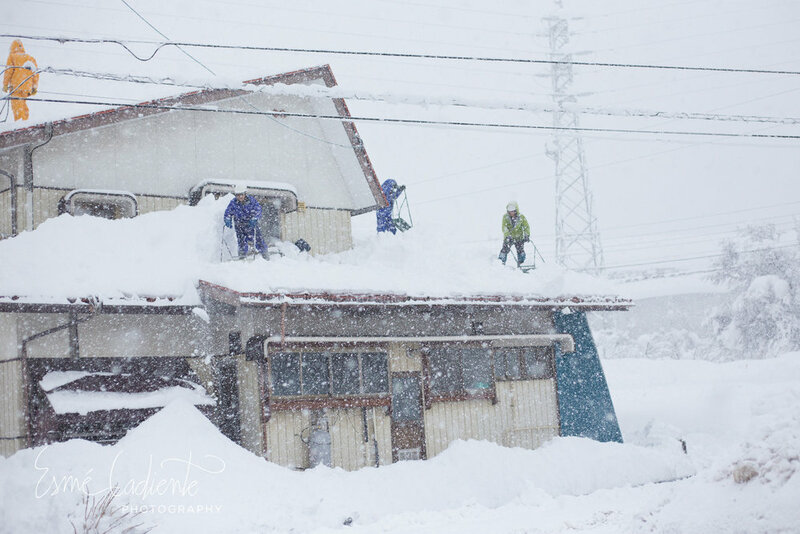 Villagers are seen all over town shoveling snow and spraying the street with hot water. The amount of snow that fell in the time we were there was enough to shut down the city of Portland for a year, but the hardy people of Nozawa Onsen are simply used to it. Snow removal is an everyday task and is done with the same methodical care that is used to create a Japanese zen garden. The view of Lake Nojiri from the ridge between Madarao and Tangram Ski Circus. Hot spring water is used to melt the snow on the streets of Nozawa Onsen. Awesome run #1, as we called it. The Fire Festival begins with a parade that snakes through the streets of Nozawa Onsen. Bamboo soup from a stall built out of snow. Shoveling and snow removal duties never stop during the month of January. The streets of Myoko Akakura at dawn just as the sun began to rise illuminating Mount Myoko. Dawn in Myoko Kogen with the Sea of Japan in the distance. Awesome run #... I don't remember, but it was awesome! At low ride in the winter, trash from China collects on the Joetsu coast. In the summer, this coast line is cleaned up and enjoyed by beach goers and fisherman. The trash seen here now serves as an unintentional reminder about humans' consumptive natures. Japan was the cleanest country I have ever seen (you could have eaten off the street in Tokyo) but it also produces so much plastic, like comic figurines, and disposable waste, like face masks, plastic bags and to-go packaging for people in a hurry. Many places in the United States are beginning to implement plastic bag bans, this is just a start, but it's a place to begin in the long road to reducing the use of disposable, one-time-use plastics. Isaac took this photo of me on the Sea of Japan.